This post comes from Daniel Eichelberger. I’m like a man poking through the cold ashes of a long-dead fire—bent, intently combing, sifting, and looking for remnants of a childhood untouched by pain, and where innocence is unshattered by the knowledge of forbidden things. I’ve been poking for a long time and coming up with nothing. What kind of treasures can I really find in the leftovers of an inferno, the heat of which reduces everything to a substance nearly as light as air? If sifting through them is futile, why don’t I just give up the search? Why can’t I just leave them alone? Some of my true friends probably silently ask the same question as they observe my persistent behavior. What power is there in the remains of experiences long past? They never ask those questions in my presence. A few of them even poke around with me in this gray-and-black mess. Although I appreciate their support, they really don’t know what they’re looking for or understand the attraction such a fruitless task holds for me. Maybe the remnants of a childhood aren’t what I seek. Perhaps it’s redemption. Roger Mann's Response to "Excess Baggage"
The following is Roger Mann's response to last week's post. There has been so much hurt and confusion in my life, and all of it has left its mark. Or maybe I should I say scar. Admittedly, I have not handled it well. To be honest, much of it was in response to my thrashing about trying to find a way to live with the confusion and sadness I carried from childhood disappointments that I never resolved. I hurt those I loved, and when you do that, it leaves a mark on you too. So I guess I have a lot of baggage—a lot of excess weight that keeps me earthbound. I have walled off my heart from people, and God seems to be the only one I trust enough to allow His love to touch me. I don't want to hurt. That's a fact. But I don't want to hurt anyone else by allowing them to get close and then disappointing them. I overheard my wife ask our counselor, "Why am I not enough?" and I honestly could not tell her. I just didn't know. Why do I get so sad some days? Why do I get so angry over such little slights? Why am I so insecure with her and so self-assured with strangers? People who don't know me well seem to love me. Those who get close discover a different person entirely. It's a lot of weight to carry around. It's a lot of balls to juggle and keep in the air. And it's similar to the personality of my father. Everyone loved Dad and loved to come and visit. Those of us who lived with him often wondered why he was so different with us. I suspect there is a root belief somewhere deep that keeps this cycle going. I just don't seem to be able to find where it's located in that bag of mine and what form it takes. The woman dropped out of line to repack and stuff items into her large purse. As I watched, I thought of the excess luggage most of us carry—hurts, slights, betrayals, and rejections. We haven’t let them go, even though they weigh us down. For example, whenever someone mentions a person we haven’t forgiven, we feel a heaviness inside. Even anger. Those thoughts reminded me of Greek mythology and Atalanta, the fleet-footed goddess. Her father, King Schoeneus, wanted her to marry, but she refused. Finally, she agreed to marry only if her suitor could outrun her in a footrace. If the challengers lost, they would be put to death. Many young men tried, lost the race—and their lives. Hippomenes became the next suitor and asked the goddess Aphrodite for help. She gave him three golden apples. The race began and Atalanta was soon twenty yards ahead. Hippomenes rolled one apple in front of her, and she stooped to pick it up. A little later, he rolled out the second and she grabbed it. And the third. By then, Atalanta was so weighted down, Hippomenes passed her and won the race. The story teaches us that we self-sabotage by holding on to “golden apples” of anger, resentment, and unforgiveness. They hinder by weighing us down in successfully running life’s race. We know they’re there, and we know they hold us back. Even so, it’s not easy to cast off those hurt feelings and rejection. With God’s help and opening ourselves to individuals we trust, we can dispose of the things that weigh us down. I'm running a race of life. I rid myself of every kind of excess baggage. 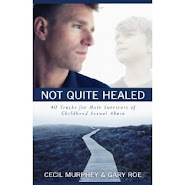 Cec has written about those he calls the wounded healers—men broken by their pain who are healing and at the same time encouraging others who face similar battles. A scene in the recently released movie I Can Only Imagine illustrates the principle of the wounded healer. The movie is based on the true story of singer Bart Millard. 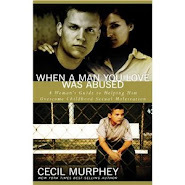 Bart grew up being severely abused by his father—physically, verbally, emotionally. During one of his concerts we see Bart sharing a bit of his abuse story and the healing he is experiencing as an adult. As Bart speaks, the camera keeps cutting away to a young boy in the audience. He’s around 12 years old. Those around him appear oblivious to his presence. He looks small and alone. He might as well be invisible. We’re never introduced to the boy; we never learn his name; we never hear his story. But his face tells us that his pain is a pain we who were abused recognize. He is intently listening to Bart’s story, hungry for hope. The scene ends leaving us with no idea what happens next for this boy. We were once that little boy, alone and invisible. But somewhere along the line we heard a story of hope, or watched someone living with courage, or just knew within ourselves that there had to be a way to escape the pain we were living in. Because we’re healing, even if ever so slowly, we may be the ones who give hope to that boy. We may never talk to him, and we may never know his story. But he’s watching. And he sees something about us that is genuine and real. Something that speaks hope to his heart. 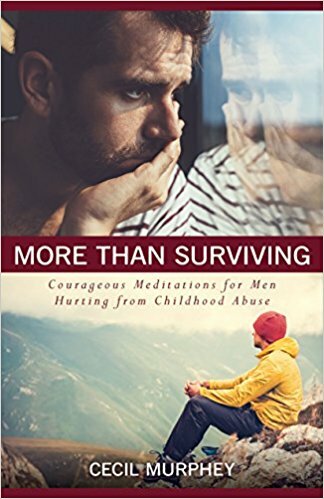 One day he will become one of us, a man who though broken by his pain is courageously healing and offering hope to the next abused boy feeling invisible in the crowd.